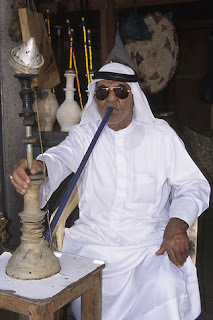 Owners of shisha bars in Dubai have complained of a massive drop in business due to new health regulations that have banned outdoor smoking of the tobacco. Dubai Municipality launched a crackdown, banning smoking near schools, mosques and residential areas, on January 1. The National Tobacco Control Committee, which drafted the new law, says it will help reduce smoking and improve air quality. However, the manager of ‘The Grind’ cafe in Al Mankhool has said that the cafe has seen a 40 per cent drop in business after he was forced to take all outdoor shisha smoking inside. “It’s terrible. It destroys the whole culture of shisha smoking,” manager Mervin Bacheco said. Bacheco, from Goa, India, said that the cafe began moves to comply with the regulations about three months ago and has seen a serious drop off in business. He added that the cafe has done its best to comply with all reasonable health regulations which have now been imposed by the Municipality. “The cafe will obey the law but it’s disappointing for us,” he said. A worker at one Bur Dubai-based shisha bar said she would be complying with the new law. “We have a good record and the municipality have cited us as a positive example, but new regulations seem to come in every day,” she said. Dr Wedad Al Maidour, head of the National Tobacco Control Committee, has previously said that restricting shisha-smoking to indoors would help to protect the public’s health. She said that children should not be exposed to adults’ smoke.